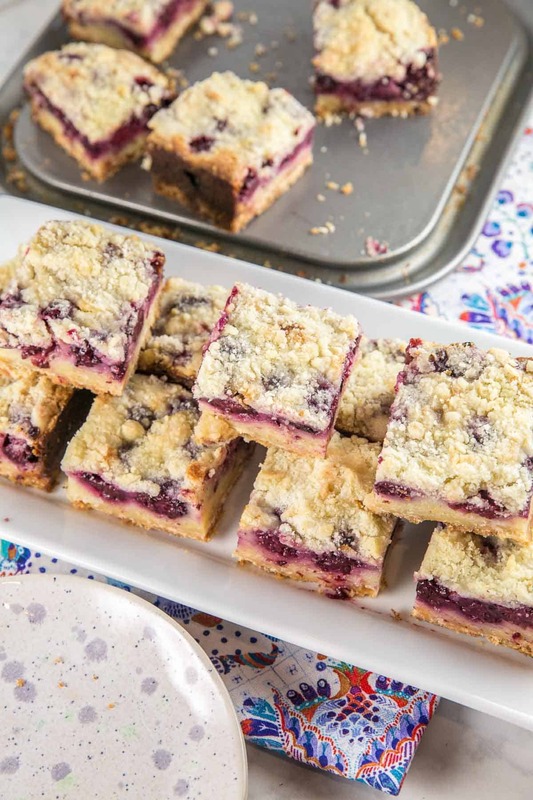 Everything you love about blackberry pie, in an easy-to-make, easy-to-share, bar form. 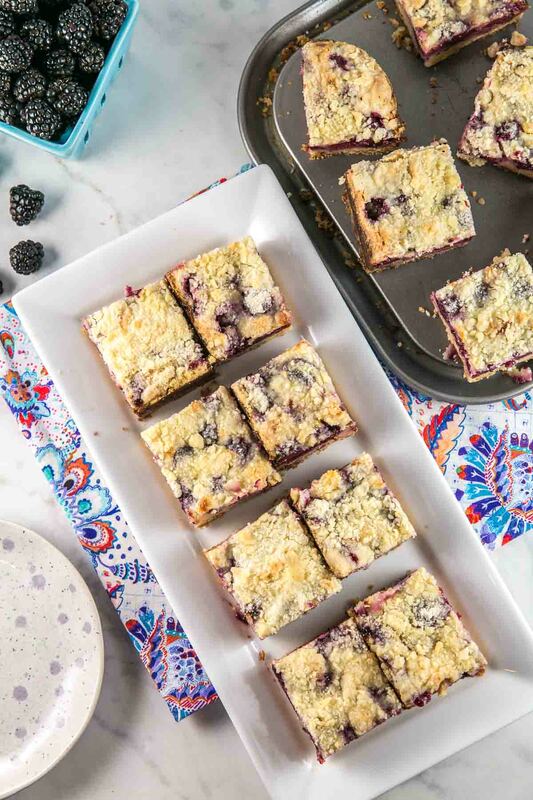 Blackberry pie bars are the perfect way to highlight summer’s best berry! I love rolling out pies. There’s something so therapeutic about slowly rolling out the dough, stretching it into a thin, round sheet. But let’s be honest: pie is not the best dessert to share with a crowd. At a sit-down dinner? Absolutely! But to bring to an event where people might be milling around with a plate in one hand? Not so much. Not to mention that it’s a little odd to show up at a friend’s house with a quarter of a leftover pie. 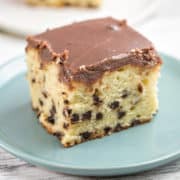 “Hi, I brought you this dessert… that I already half ate!” But it’s perfect acceptable to show up with a few servings of cookies or bars, without the friend knowing you already ate some. 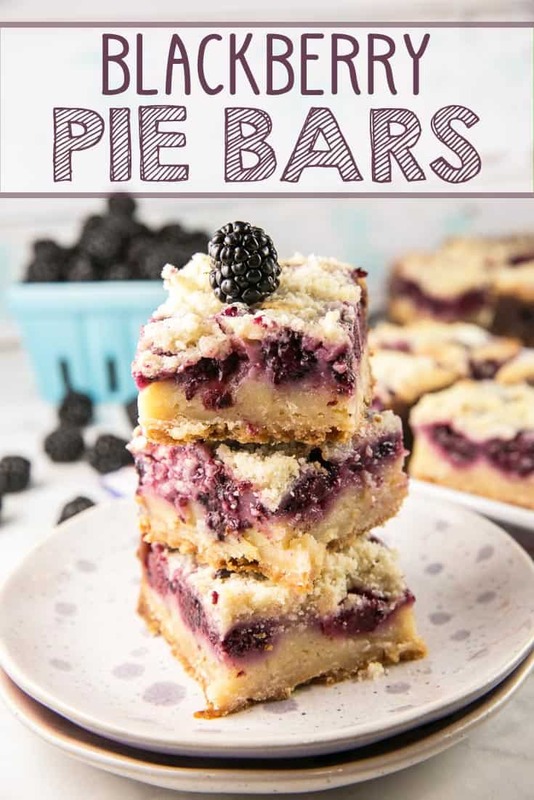 I love recipes like this that capture the flavor of a pie, but come in bar form, so I can share a few with lots of different people! 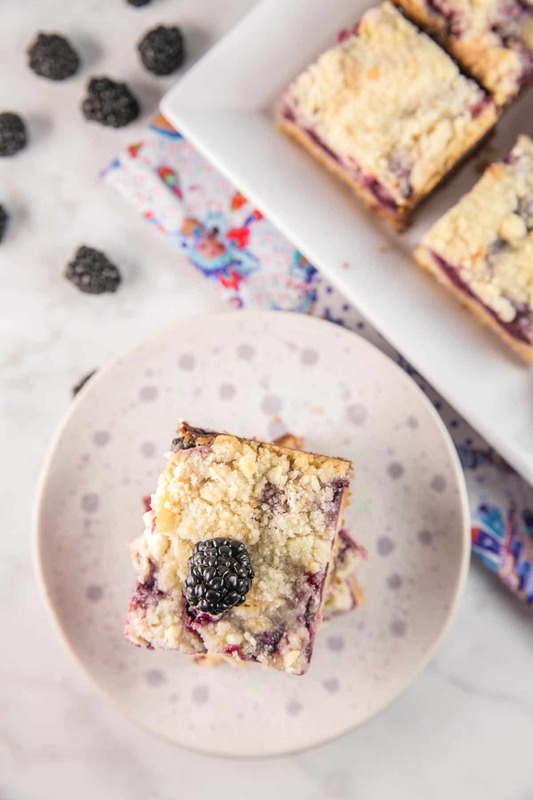 Why make one blackberry pie when you can share the love with everyone in the form of blackberry pie bars? Lemon seems to be a common flavor to pair with blackberry pie, but you’ll notice here that I use lime instead. 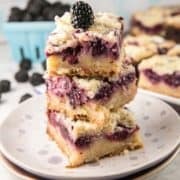 I think lime is such a great flavor for summery desserts, and it just doesn’t get more summery than a dessert using fresh blackberries! Plus, blackberries and lime are such a good combination — hello, blackberry mojitos! 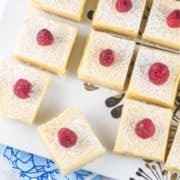 In order to remain in bar form without the filling oozing out, these have an almost custardy layer in the middle. While they are good at room temperature, they are really good when a little chilled (and so much easier to cut that way, too). 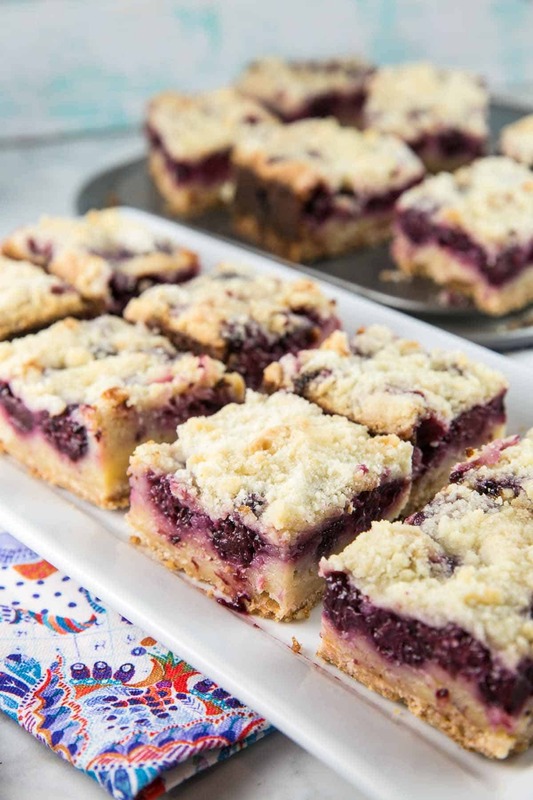 These blackberry pie bars are extremely rich, so cut the bars small. 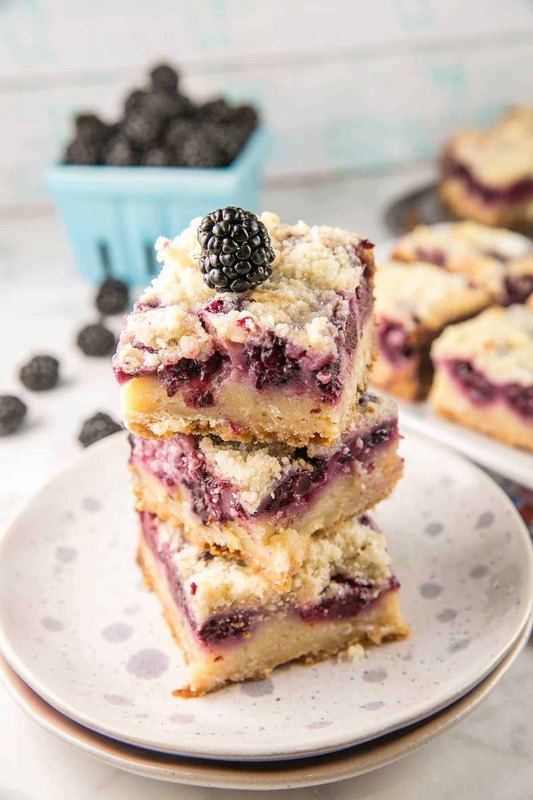 All the better to share the blackberry pie bar love around to many people! Everything you love about blackberry pie, in an easy-to-make, easy-to-share, bar form. Preheat the oven to 350 °F. Grease an 8×8-inch square baking dish. To make the crust, combine the sugar, flour, salt, and butter in an electric mixer fitted with a paddle attachment. Beat the ingredients on medium speed until the mixture looks dry and crumbly. Reserve 1 1/2 cups of the crust mixture to use as a topping. Press the remaining mixture into the bottom of the pan. Bake the crust for 12 to 15 minutes, until golden brown. While crust is cooling, prepare the filling. Whisk the eggs in a large bowl and add the sugar, sour cream, flour, lemon juice, and salt. Fold in the blackberries. Spread the mixture over the crust. Sprinkle the reserved crust mixture over the filling. Bake for 45 to 55 minutes, until the top is lightly browned. Cool for 1 hour before slicing and serving. Bars are even better served chilled. 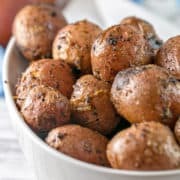 Refrigerate any leftovers for up to 5 days; bars can also be made ahead of time and frozen for up 3 months, wrapped in aluminum foil and stored in a freezer bag.